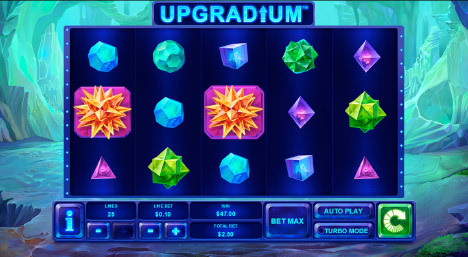 Fly Casino is pleased to announce the arrival of Upgradium! It’s a new 5-reel, 25-payline crystal-themed game that comes with many wilds and a continuous re-triggering re-spin feature. Stocked with a great theme music along with top level graphics creates the best playing experience here at Fly. By getting a wild in a winning combination your winning payout is increased to the next symbol. For example, land a five of a kind combination featuring the green pointy crystal and a wild and rather than the normal 12X your bet you’d get 16X your bet. The Crystallization Re-spins feature works by getting an orange crystal in the center reel translucent pink “Hot Spot.” When this happens, all of the symbols are upgraded by 1 level and a re-spin is awarded. During your re-spin(s), the number of new Hot Spots increases as well! All positions on reels 2, 3 and 4 turn into Hot Spots. Land the orange crystal on one of these Hot Spots and the feature is repeated. You’ll get another symbol upgrade and another re-spin. But, that Hot Spot is then removed. These upgrades and re-spins continue until there’s a spin where the orange crystal misses the Hot Spots and the feature ends. 77% X 2 Sunday! On Sunday from 00:00GMT until 23:59 GMT, all members on their deposit of just $/£/€30 or more will receive a 77% bonus up to $/£/€77 bonus. Claim it 2X! Hot $300! From 00:00GMT until 23:59 GMT, all members on their deposit of $/£/€30 or more will receive a 75% bonus up to $/£/€300.00. $220 BIG TUESDAY! From 00:00GMT until 23:59 GMT, all members on their deposit of $/£/€30 or more will receive a 110% bonus up to $220.00 bonus.